It’s time to show off those colors of purple, green and gold! Let’s start off this Mardi Gras Season with great memories that will never get old! Join us for a night of costumes, drinks and great music. DJ Leon will be playing from 22:00. DJ, producer, writer and electronic music enthusiast alike, DJ Leon comes out of India. When not performing, he spends his time creating his own music. Having spent many years playing at the local night clubs in Muscat, DJing special events, DJ Leon has had a lot of time to develop his sound. For him, it’s all about the mood and groove. Playing those tracks that get you tapping your feet and nodding your head without you realizing it, regardless of genre, tempo or style. Don’t be surprised when you suddenly find yourself dancing! 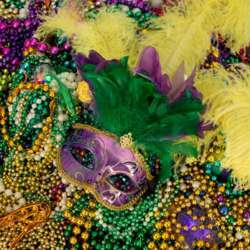 So, put your best Mardi Gras costume on, the best costume will win a gift certificate from Park Inn! *Price includes 2 drinks includes beers, house wine (red and white) and 5 types of canapes to feast on. **Please only sign up for this event if you can attend as we need accurate numbers for planning. If you have signed up and later realize you can't make it, please take the time to cancel your attendance. Thank you!